Stunning 4BR/4BA Mt. 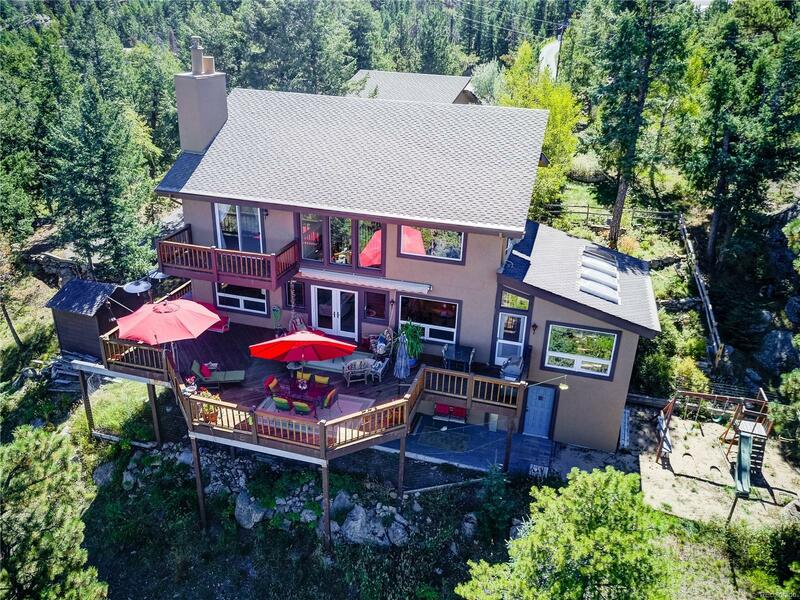 Contemporary on 7 Pristine Acres with Mt. Evans AND 180 Degree Mt & Valley Views! This home was completely remodeled inside and out in 2007! Impeccable! Enchanting Garden Walk-Way takes you to the Entry/Main Level that features Expansive Windows that fill with those views. Spotless Hardwood Floors. Gourmet Kitchen with Cherry Cabinets, Granite Tops, Stainless Steel Appliances & Designer Fixtures. Wonderful Great Room with Cozy Fireplace & Built-In's. Open Dining Area, Half Bath & Best Laundry Room ever. PLUS, a Sun Room you will never want to leave. And the Perfect Deck. Upstairs: More Incredible Views, Two Bright Bedrooms, Bath & Master Suite with Private Balcony, Spa-Like Bath & Walk-In Closet. The Walk-Out Lower Level has a huge Bonus Living Area, 2nd Cozy Fireplace, Office Area, 4th Bedroom, Bath & Storage or Workshop. 2-Car Garage & Timber Carport that gives direct access to front door. Owned Solar Panel System. Evergreen Meadows Gem! This one will impress! Builder Name 2: Remodeled! Inside & Out!